So. Angel having crossed the Bridge on Monday (you can see her whole story, with the ending, on this page), we’re all grieving and all having some serious adjustments to make. Trick and Freya are both demanding a bit more attention than normal but are largely okay. Cory, however, is having more trouble. For as long as I can remember, he’s only been willing to cuddle in the bathroom – it might be connected to his repeated sinus issues, my sitting with him and the steam helping, I don’t know – and he summons me there with kitten-cries when he’s feeling the need for being picked up and held or for me to sit down on the closed toilet and hold him. 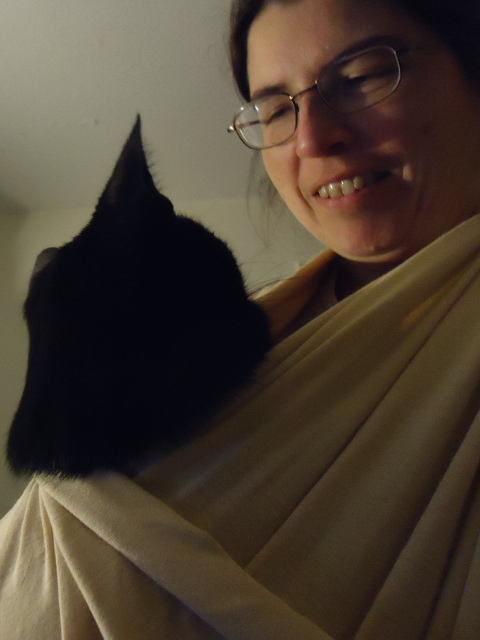 He flatly refuses to be held on my lap anywhere else, although he very much enjoys being carried around for as long as my arms will hold out. Tuesday afternoon, he woke up with a start from a sound sleep and jumped down from the bed to sit next to my chair, and something was clearly wrong. I scooped him up, expecting a brief cuddle before he left, and Jackie grabbed my/Bearcat’s fave fleece shawl to tuck over us and cover him. He didn’t leave. He just sort of laid there, non-responsive, for long enough to make me rather worried (right, like I wasn’t before that?). Finally he started to purr, and then relaxed against me, though he didn’t want much petting, and actually spent a total of about an hour there, part of it apparently asleep. 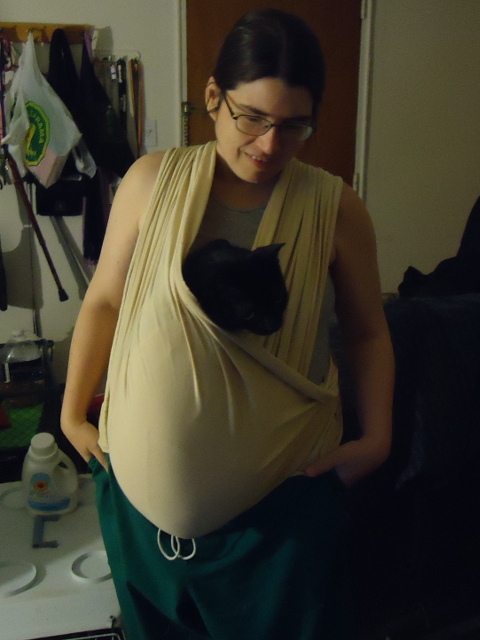 I mentioned this on Facebook, and said it was a shame he’d outgrown the sling I carried him in as a teeny babycat (when he’d lost his blood mom, and been rejected by a possible feline foster-mom, and came to us sick and would get agitated every time I set him down). GrammyOgg suggested something called a moby sling, which is meant for human babies. Cory, at roughly 15 pounds or so, is certainly the size of one. 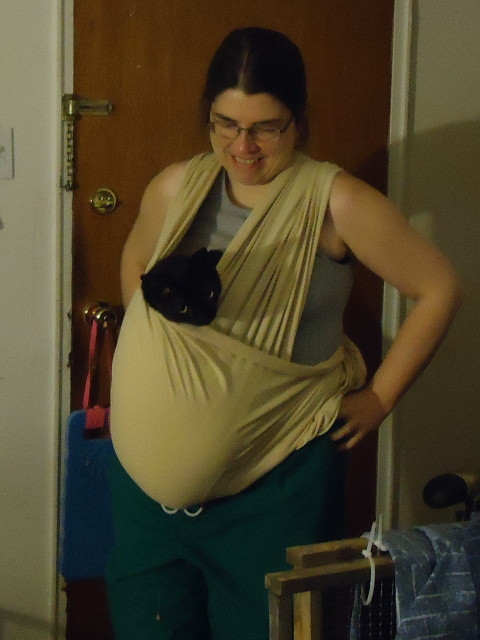 Stretchy fabric, something along the lines of 20-24 inches wide and upwards of 5 meters long (yes, I swapped systems between measurements, don’t care :P). We have a set of jersey-knit sheets we don’t use anymore (the fitted one in particular is holey beyond words thanks to kitty claws). With much help from Freya (“Mom!!!! That sheet’s going to attack you!!! Don’t worry, I pouncified it and subdued it to protect you!! !” “Freya! Not string, measuring tape!! !”) I got two 24-inch-wide strips that are about 8 feet long, and sewed them together – there’s about a 2 inch overlap, and therefore two seams, so it should hold, I hope. 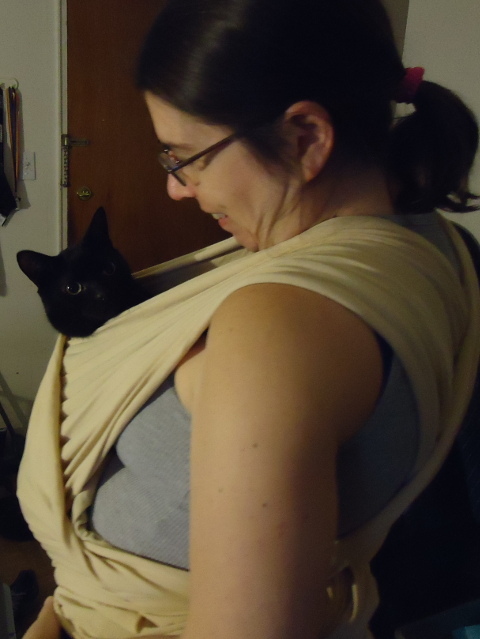 Late Tuesday night, we watched the videos on how to do it and looked at some instructions, and tried what’s called the Kangaroo Wrap from the mobywraps website. I’m not entirely happy with it, he sits down too low and doesn’t have much support. However, we tried. 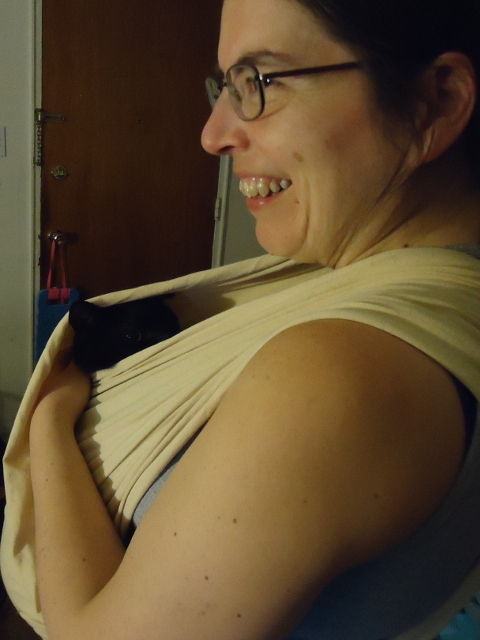 He squirmed around briefly while we got him settled… and then he started to PURRRRR. We tried, even more briefly, a kind of cradle hold off a YouTube video, and that worked better. He’s a CAT, I’m not terribly worried about how much it flexes his spine or whether he can breathe – he’ll let me know, and have you SEEN a cat sleep? He was restless by then, though, so it was a short experiment. Being a cat, he’s probably going to want to do this at times that are inconvenient and not at times that would be easy, of course. But if it helps reassure him, it’s worth it. 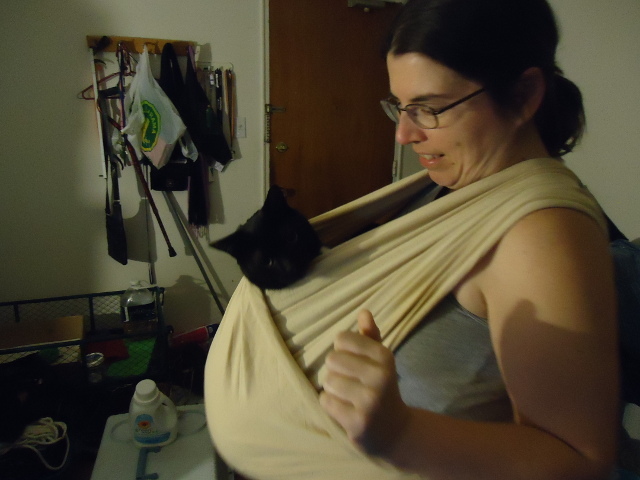 Here are a few pics of him as a marsupial. Like I said, not enough support so he sits very low, but we’ll work on it. 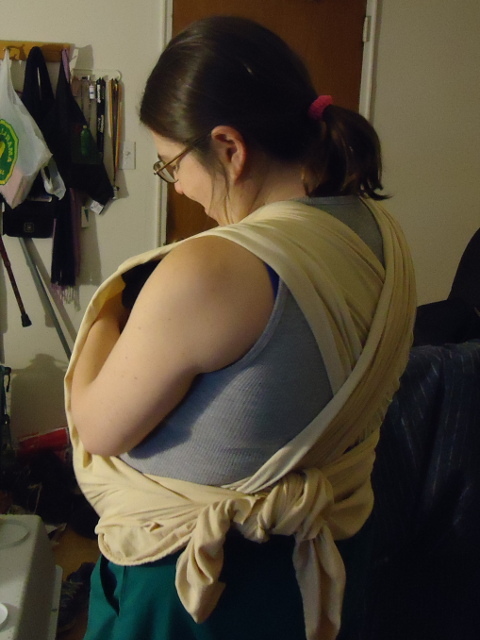 I want to taper the ends of the wrap or add ties, so I don’t have a huge knot at my back, too. More pics to come! I’m SO glad this worked out! With a little adjustment to how you tie him in there, you should be able to manage to have both of you comfy with the concept. This just made my day that it was a suggestion that worked! Oh what a good mama! And very beautiful Cory-Bear looks very happy with his new pouch!!!!! Oh what we don’t do for these spoiled rotten furrrbabies! Steph, you look like you are pregnant with twins!Fortunately you don’t have to give birth to this one. Ha! photos 1 and 4 are my favorites!